On December 11, 2018, members of the Athens community gathered for the Classic City Band’s annual holiday concert at the State Botanical Gardens in Athens, Georgia. The Classic City Band is the oldest continually operating community band in the state of Georgia; the band dates back to 1976. The concert featured a variety of tunes that conveyed the spirit of the Holidays. Santa was even brought in to join in the festivities, listening closely during a rendition of “Santa Baby” sang by Cass Robinson. Check out my coverage of this event by clicking the link in this post. On December 8, 2018 the University of Georgia Gymdogs showcased routines for the upcoming season at the team’s annual First Look event at Stegeman Coliseum in Athens, Georgia. The event followed the flow of a normal meet, with the exception of another team not being present. Gymnasts demonstrated a vault rotation; this was followed by a rotation on the uneven bars and two alternating rotations of floor exercise and balance beam. This year’s team is primarily made up of freshman student-athletes. The team features only a single senior, Sydney Snead, and two juniors. This event enabled fans to see both the new freshman and the seasoned competitors. The Gymdogs will host their first home meet of the regular season on January 5, 2019 against Ohio State. This was my first opportunity ever to cover a gymnastics event. I was only partially pleased with the way these photos turned out. For future meets, I have found it will be necessary for me to position myself in different angles to start capturing some of the shots necessary to telling a full narrative. Fortunately, this event was covered by both me and Gabriella Audi, a staff photographer for the Red & Black. Between the two of us, we were able to capture some of the best action of the day. The title of this post links to the gallery on the Red & Black website. On December 4, 2018 the University of Georgia women’s basketball team took on the Furman University Paladins at Stegeman Coliseum in Athens, Georgia. The Lady Dawgs defeated their opponents 61-38 in regular time. The team now stands 5-0 undefeated at home, however they have been unsuccessful on the road. Their overall standings at this point in the season stand at 6-3. The Lady Dawgs take on Villinova University on December 14, 2018. See my coverage from the event by clicking the link in the title of this post, which links to the Red & Black website gallery. I have also posted some select shots from this game on my portfolio page on this website. I’ve been in a bit of a lull recently. Despite taking assignments every week, I have not been publishing my work on my own outlets. There have been a few galleries that have featured my photos on the Red & Black website, but I haven’t put anything up on this website or on instagram. What I’ve been doing recently is going through my photo archive to find photos that I want to publish here. Today I’m posting my first update in a long while, and it’s displayed both here and on the portfolio page of this site. I’ve chosen a photo I’ve entitled “Chilean Sunset”. This is a photo I took in March of 2017 when I was lucky enough to get to go on a Habitat for Humanity trip to Chile. A group of about 20 juniors and seniors from my high school, Pace Academy, travelled to Chile to build a home for a family in need. This photo is from our very first evening near the build site. We had driven all day from the capitol city of Santiago to arrive at small cabins nestled on the Pacific Ocean. As the sun set that evening, we ventured out onto the beach for the first time to relax before a challenging build. The next morning we drove nearly 40 minutes to get to the build site, which was in a remote township. We continued to make this drive, a near 80 minute round trip, every day for the next week. Every day we had this beautiful view to look forward to. The subjects of this photograph are my friends who went on the build. towards the shoreline, a group is visible with a Chilean flag draped over their shoulders. One of favorite features of this photo is on the far left of the frame, where one of my friends, Rob, looks South on the beach. Of the three nearly identical shots in the series I took at that moment, this one stands out due to his look being captured in the edge of the frame. On Nov. 9, 2018, the University of Georgia men’s basketball team played Savannah State University for their season opener at Stegeman Coliseum. This game was the first in the Tom Crean era. Record crowds attended the event. The UGA men defeated Savannah State 110-76. Check out my coverage from the event by clicking on the link in the title of this post and look on my instagram page, linked through this website, to see some of my personal favorites from the game. On Nov. 9, 2018, the University of Georgia women’s basketball team took on the St. Bonaventure University Bonnies in their season opener at Stegeman Coliseum in Athens, Georgia. UGA defeated their opponents 67-40. This was my first attempt at taking basketball photos. Overall, I was satisfied with how they turned out. It’s extremely difficult to get photos at the net in sharp focus. Players are often moving extremely quickly, and autofocus typically lags in a dark environment like Stegeman. To make matters more complicated, the referees often stand right in front of photographers. It’s not possible to get the other angles from the opposite side of the net on one end of the stadium due to cramped space. See my coverage from the event by clicking on the link in the title of this post. On Nov. 2, 2018 the University of Georgia women’s tennis team started the first day of play in a tournament that lasted the weekend. I was there to cover the doubles matches and some select singles matches for the Red & Black. While the matches were set to be played outside, poor weather conditions persisted throughout the day. A decision was made to hold the doubles matches for the day inside the Lindsey Hopkins Indoor Tennis Courts. Unfortunately these courts are incredibly dim. For sports photography it’s generally desirable to have crisp, clean images. In a dim environment this can be nearly impossible. Even shooting with a wide open aperture of f/2.8, I struggled to get clean images. Increasing my ISO settings caused a grainier image, and too high of a shutter speed failed to capture enough light. To make matters more complicated, I had never shot a tennis event besides a few of my friends hitting out on outdoor courts in broad daylight. Results for this tournament were mixed. Check out my photos by clicking the link in the title of this post. The best photos are from later in the day when play was moved outside for the singles matches. Last night I got the chance to cover my first concert for the Red & Black. Up until then, I had never ever photographed a live concert professionally. Sure, I’ve stood with my phone and tried to get a usable shot for a half-decent instagram post. I had never tried my hand at bringing a real camera and photographing a concert. Last night I had to do it for a sold-out show at the Georgia Theatre for an actual publication. The pressure was on. Recently I’ve upgraded my equipment to be sure I can cover events like this. I’ve purchased a refurbished Nikon D610, which is a full-frame DSLR. Along with a 70-200 f/2.8 lens, I’ve found that it is perfect for almost every kind of event I shoot. Last night’s concert was no exception. For concert photography nearly any photographer will tell you you need a wide aperture along with a high ISO sensitivity and fast enough shutter speed to avoid blur in your photos. It is easy to get everything set, take some test shots, and be confident in your settings before the concert starts, however during the show lights are constantly changing. While one moment your subject might be in perfect lighting, the next they may be washed out or shrouded in complete darkness thanks to the lighting effects of the venue. A shutter speed like 1/200 with an ISO sensitivity of 5000 might work perfectly for one shot, but on the next everything is wrong. To further complicate matters, it is nearly impossible to use autofocus in concerts due to the same conditions that make getting your control settings right so difficult. One small movement in manual focus can cause your subject to be either in perfect clarity or blurred enough to make the shot unusable. All of these factors make shooting at a concert extremely difficult. As an added bonus for last night’s concert, the headliner, COIN, only allowed photographers to cover the first three songs before we had to put our cameras away or risk being asked to leave. If I was unable to get good shots in those first three songs, everything would be lost. Fortunately things turned out alright. While in the future I hope to improve my concert photography, I was not disappointed in my debut effort. I am always seeking to improve as a photographer, and last night was a fresh challenge to push me beyond what I’ve been comfortable with in the past. I’ve included one of my personal favorites from last night, a shot of the lead guitarist for the band Arlie silhouetted with a lens flare across the frame. It’s not the most detailed shot, but it feels evocative to me. Check back later for more shots from this event and some others I covered this week that I’m going to post in my gallery. Also click on the post below this one to be taken to the gallery picked from my shots by our photo editor on the Red & Black website. On Oct. 21, 2018, the University of Georgia soccer team faced the Alabama Crimson Tide in their last regular season home game. The Dawgs finished 1-1 in double overtime. Unfortunately ending in a draw means that the UGA team will not be advancing to the playoffs this year. This being the last home game of the season, it was senior day. Seniors were honored before the start of the match. Despite over 17 shots, the Dawgs were unable to score a second goal to push the victory. In the college soccer regular season there are no penalty kick shoot-outs. Overtime periods are played as sudden-victory periods, meaning that if a team scores, they automatically win and the rest of the overtime period is not played. After regular time and two of these periods, neither team was able to claim victory. Check out my gallery for the match on the Red & Black’s website by clicking on the link in the title of this post. Below I’ve included my personal favorite from my coverage of the match. On Oct. 20, 2018, the University of Georgia equestrian team took on the Oklahoma State University cowgirls at the UGA Equestrian Complex in Bishop, Georgia. The morning began with abysmal weather as a cold rain poured on the event throughout the preparations for the meet and the first events. Despite the poor conditions, the Bulldogs crushed their opponents in a 13-6 victory in all events. There are 4 events in equestrian meets: equitation on the flat, equitation over fences, horsemanship, and reining. Riders in each event compete on preselected horses; each team must compete on the same horses. Horses are selected from the home team. Each rider receives a score for their performance on the horse. After both riders have ridden the same horse, their scores are compared. Whoever has the highest score receives points. The riders are judged on a variety of elements including their posture and handling of the horse. In equitation on the flat the Dawgs went 4-0, in equitation over fences 3-2, horsemanship 3-2, and in reining 3-2. This meet was the second meet in the regular season and the first home meet for the Dawgs. The Dawgs are back at home for their next meet on Nov. 9th against rival team Auburn University. Check out a combined gallery of my photos along with Kate Skeean’s photos by clicking the link in the title of this post. This was my first time covering equestrian; Kate is well versed in the sport. Below I’ve included one of my personal favorites from my coverage of the event. I’ve always struggled to define myself as a “photographer”. For a long time I have clung to the term “enthusiast” to describe myself because while some of my photos were decent, I felt the vast majority missed the mark. It’s one thing to own a camera, and it’s entirely different when you actually know how to use that camera. The same can be said for editing software. Since coming on with the Red & Black, I’ve been on a steep learning curve. I had never tried my hand at editing on Lightroom, and while I understand the basics, I certainly don’t know the finer points. Everyday I am constantly challenging myself to learn how to take better photos in camera and edit them in Lightroom with precision. One of the biggest problems I’ve had recently is with detail shots. I have been reluctant to get sharp details while covering action packed events, and I have been even more reluctant to crop down shots to get sharper detail. One of the beautiful things about the camera I have, a Nikon D610, is that I have the ability to crop without sacrificing clarity. As long as I get my subject in focus, I can crop down and still have stunning clarity. 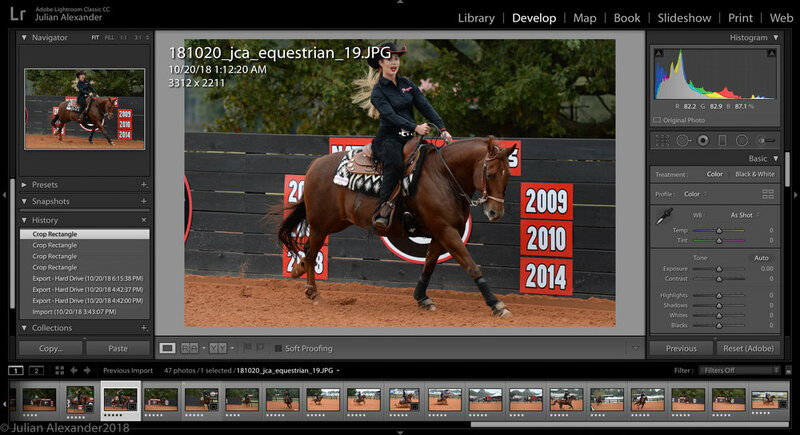 Yesterday, October 20, 2018, I tried my hand at photographing the University of Georgia equestrian team in action. I took this assignment as a shadow assignment; I did not want to be responsible for failing to get key shots since I had never covered an equestrian event. Lots of my shots for this event were far too wide. A lot of the frame was filled with empty space that needed to be cut down. A good example of this are the screenshots I've included of my workshop in Lightroom. In the first shot I have the photo I actually submitted to my editor at the Red&Black, and the other is the cropped photo after I talked with my editor about detailed shots. An important point to notice in these two shots is the difference in where your eye focuses. In a wide shot we are able to take in a lot of the scene, but it is unclear where we should direct our attention. There often is so much in the frame that the main subject can actually become muddled. The tighter shot allows you to focus in on a specific subject. It is easier to read their expression and interpret what is going on as a result. In my upcoming assignments I hope to capture some tight detail shots. I also plan to crop down to avoid unnecessary wide angles. While it is important to include a variety of shots for each assignment, I need more detail. Perhaps soon I will feel more comfortable defining myself as a “photographer”. In my current job with the Red & Black, photography is relatively straightforward. What we do is pure photojournalism - we seek to portray the world as it is seen. In my job as a contributor there is little room for artistic interpretation. If I do a portrait assignment, all subjects should be in sharp focus. Nothing is left to abstraction. In my personal work, I enjoy playing with the settings on my camera to produce something different. One of my favorite areas to explore is in out-of-focus photography. As a child I found I could blur my own vision at will, and through the lens of my camera I am able to do the same thing. For those that don’t know, DSLR camera lenses are equipped with a manual focus that can be used to create either sharp images or abstract pieces. Whenever I play with abstract focus, I typically emphasize the relationship between light and focus. Out of focus lights can create dazzling images that are awash with color. The effect is similar to the cover painting of The Great Gatsby, where the lights of New York are represented by simple colors, not by specific buildings of the skyline. Playing with out of focus photography typically does not work with buildings. Architectural photos are best in sharp focus; a wide angle shot of a building will simply look like a blob out of focus. Light is almost always the key element. Out of focus photography almost never works in the daytime when the lighting is flat, like at noon. In this post I’ve included some of the photographs I took while in the National Gallery of Art in Washington D.C. The West and East buildings of the National Gallery are connected underground by a tunnel that is lit with thousands of LED lights. These lights can be programed in different patterns to create stunning displays. When I was last at the National Gallery of Art in 2016, I took some time to play with my camera in this tunnel. I shifted the focus in and out to get the exact depth of field I could see in my mind’s eye. The result was dazzling. Instead of sharp focus lights that felt cold and empty, I created an abstract piece using the design of the space. Early this morning I woke up before the sun had risen above the horizon in Athens, Georgia, and I headed over to Big City Bread Cafe for a discussion on the implications of having a conservative majority on the Supreme Court now that Brett Kavanaugh’s nomination has been confirmed. The discussion was led by Dr. Christian Turner, an associate professor of law at the University of Georgia School of Law. Also notable was the attendance of Deborah Gonzalez, the incumbent for U.S. House District 117. Despite the cold weather, the discussion prevailed for a long time. Read our reporter’s recap and see the leading photo by clicking on the title of this post. On October 17, 2018, the University of Georgia hosted a dedication ceremony to reopen Lake Herrick in Athens, Georgia. The lake is part of the UGA intramural sports complex just south of East Campus Village. The lake had been closed for 16 years. In 2002 the lake was closed due to pollution. Within the past few years, serious attention and effort has been given towards rehabilitating the lake and surrounding waterfront. Partners on the project included the Georgia Power Foundation and Riverview Foundation. Originally the lakefront featured a sandy beach for UGA students, however the newly reopened area has been completely redone. The waterfront now includes lawn space and trails; close to the water vegetation has been planted. UGA students are able to rent canoes, kayaks, and stand-up paddle boards through the Ramsey Center. I covered the dedication, where there were four speakers and a ceremonial ribbon cutting to declare the lake open. After the ribbon cutting, Recreational Sports staffers gave a small boating demonstration from the new boat launch dock. 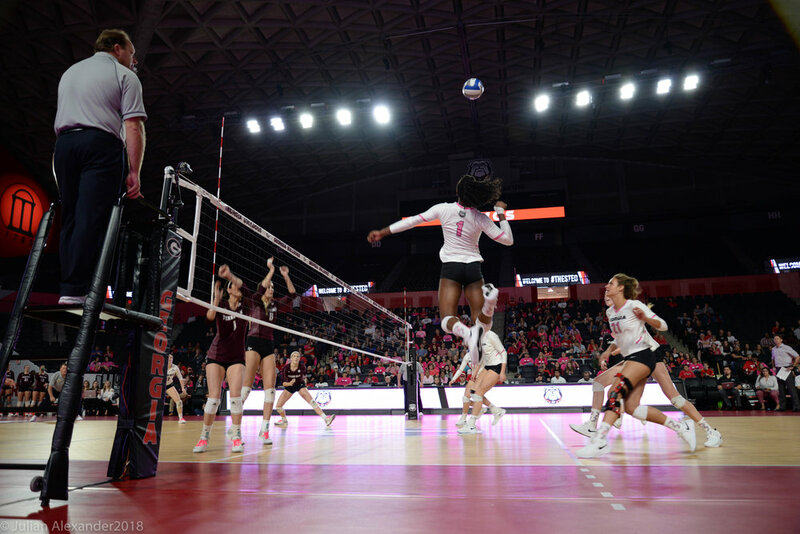 On Sunday October 14, 2018 the University of Georgia volleyball team took on Texas A&M at Stegeman Coliseum in Athens, Georgia. The UGA team held their opponents through 5 sets, winning the opening set 24-26, but the successive sets proved difficult. Sets 2 and 3 went to A&M 25-20 and 25-22 respectively. The Georgia team made a comeback in the fourth set to tie the match 2 sets all, winning 23-25. Ultimately Georgia lost in the fifth set 15-12. Every point was hard fought, but ultimately the team fell to their Texas opponents. In recognition of National Breast Cancer Awareness Month, the UGA players are sporting pink trim on their uniforms instead of the typical red. Fans are encouraged to come to matches decked in pink, and almost all of the screens in Stegeman Coliseum are illuminated pink. Stegeman Coliseum has traditionally been the home of UGA Basketball and Gymnastics. UGA Volleyball has been based out of the Ramsey Center in Athens, Georgia since 1995, but recently matches have been played on a temporary court set up in Stegeman. Stegeman offers a far more appropriate venue for the Dawgs compared to the dated Ramsey Center. A recent renovation upgraded the facility’s electronics and allows for far more spectacle during matches. Welcome to my website! This blog is the home of my current updates. As a contributor for the Red and Black, the independent student-run newspaper in Athens, Georgia, I have many opportunities to cover a wide range of events. Currently I have turned my focus to sports. It is here that I plan to post links to galleries on the Red and Black website. As a photographer I seek to portray the world as I see it, and share my worldview with others. I attempt to do this both in my photojournalism work as well as my personal and artistic work. I hope that this website gives you a window into my world, and perhaps inspires you to show others how you view the world. All creative efforts build upon those that have come before. In my own work I seek to emulate others who inspire me and create based on my interpretations of their work. Despite having known how to use a camera for a long time, I have struggled to define myself as a “photographer” . Now that I find myself photographing on a regular-basis, perhaps how I perceive my work will change. I now find I feel more like a photographer every day. Like those that came before me, I have a lot to learn. I hope you enjoy watching me learn. In addition to the current events I photograph, I will also be posting photos from my archive that I think are worth sharing. Keep an eye out for photos from my previous journeys and all those to come!